The best weight loss system – that’s not only effective but allows you to stick to it for as long as you need – must be synergistic AND sustainable. You’ve certainly seen the many so-called “best weight loss plans” on the market today. But, as you may have noticed, most will not work for you – here’s why. First, the best weight loss programs are not necessarily the most advertised ones; big bucks or intensive marketing campaigns do not equal effectiveness and safety. Second, the “best” system is the one that works best for YOU as an individual. Why? Because you’re not losing weight in the same way as someone else. Let’s take a look at the first part: a weight loss system’s elements working together in a synergistic way, amplifying each other. …Just like our system here, at BrainyWeightLoss does. The synergy of a great weight loss system makes it much more effective than simply the sum of its parts. 1. Your mind is where it all starts; your mind has to deal with any (unconscious) resistance you might have to changing unsupportive habits and sabotaging behaviors, giving you the motivation and focus you need to stay the full course. In fact, when it comes to reaching your weight and fitness goals, most often than not the missing link is the mind-body connection. If you want to change almost anything about yourself mind hacks are essential. “Mind hacking” is a relatively new concept that means altering your thinking with superior intelligence tricks and through neuroscience. Mind hacks make you smarter, allowing you to achieve your desired weight loss goals easier, faster and with minimum of fuss. 2. The right nutrition for you – a.k.a. your customized body type diet – switches your body from the calorie-storing mode (as fat), to the calorie-usage mode (as energy) so you don’t lose muscle mass and water, but take your body into effectively burning fat for weight loss. 3. Slimming workouts make you build your lean muscle mass and burn fat faster getting you fit and toned in the least amount of time: feminine and fun exercises to lose weight quickly – most women just looove these! Or, some of the best exercises to burn fat in just 15-20 minutes a day (for both men and women). 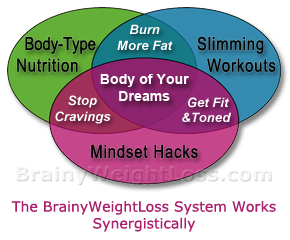 So when you choose a weight loss program, make sure it has all these three components working in synergy. If you’re missing any one of these three critical elements you struggle unnecessary for just a fraction of the results. Once you apply the concept of synergy, you simply CANNOT fail! You have to understand this. Reaching your weight goal won’t happen overnight. You need a smart strategy to keep you on track without frustration or struggle. Are you be able to keep at it for the long course if your weight loss plan doesn’t take into account your specific body type, your metabolism and lifestyle preferences? …is like trying to hold your breath under water! For example, you might lose weight easier on a high-protein, low-carb diet than on a high-carb, low-fat one, depending on your individual needs. Also, you might get better results with a lighter workout routine than with a high-intensity one. Or, you might prefer a challenging whole-body exercise like jogging than a more relaxed one, like yoga or tai chi. So it must be something that you can live with for the long term. Plus, when you surf the web for the best weight loss system it’s hard to know what to believe or who to trust. 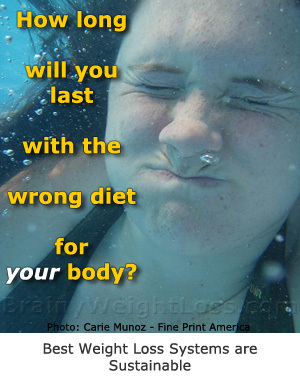 Everyone has different ideas about which are the best weight loss plans. At the end of the day, “the best” weight loss programs are different according to who’s actually promoting them. But you’re smart; use your own judgment and evaluate the best weight loss plans in terms of which works best for YOU specifically, and which you could incorporate easily in your everyday lifestyle. Look at the body type diet for you. Such a system of customized nutrition and exercising that works with your body (not against it) is both synergistic AND sustainable, so you’ll be able to stick to it for as long as it takes you to lose those extra pounds. And if you feel like you’d like our expert guidance on how to choose the best weight loss system that matches your individual situation, contact us and ask about our in-house weight loss coaching program.